sama bin Laden in a tape posted on the Web encourages Sunnis in Iraq to retaliate against Shiites, deviating from al Qaeda’s stand of not promoting sectarian violence. The al Qaeda leader says that Sunnis in Iraq are experiencing annihilation. Bin Laden also says that the only way for them to win freedom is by “holding on to their jihad” and ousting the occupying power from Iraq. Over the past four years, key members of the Bush administration have claimed that al-Qaeda is “on the run” (Donald Rumsfeld and Condoleezza Rice), “disrupted” (George Tenet) or “decimated” (President Bush). At the same time, however, significant terrorist attacks around the world have dramatically increased since Sept. 11, 2001, most of them conducted by militant Islamists. How does one reconcile this apparent contradiction? COOPER: Good evening again. We begin with breaking news, the kind that raises a chill whenever it happens, a new message tonight, an audiotape purported to be from Osama bin Laden. It came out just moments ago. CNN’s Octavia Nasr has been translating it and joins us now from the newsroom in Atlanta. Not since the late Egyptian president Gamal Abdel Nasser has an Arab political figure shaken the world as Osama bin Laden has. Journalist Peter Bergen’s biography of the man who has fascinated admirers and horrified adversaries elicits scores of interviews of those who actually met and knew him personally. One theme of this revealing book is the ideological and military struggles bin Laden waged against the Afghan commander Ahmad Shah Masood. A second refrain is that bin Laden certainly thinks strategically, but often acts on impulse and commits blunders. Osama bin Laden and his number two man, Ayman al-Zawahiri, would have first met Abu Musab al-Zarqawi around 1999, just after he had been released from a Jordanian jail and made his way to Afghanistan. On April 30, 2003 two British middle-class citizens of Pakistani heritage walked into Mike's Place, a nightclub in Israel's capital, Tel Aviv. One of them detonated a bomb killing himself and three others. This appears to have been the first suicide mission carried out by a western citizen motivated by al-Qaeda's ideology. 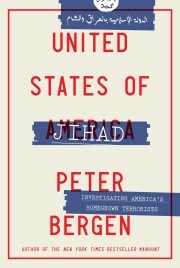 I want to bring in our terrorism analyst, Peter Bergen. You spent a lot of time studying al Qaeda, studying this case. What do you think the reaction among the terrorists is going to be to this verdict? Ayman al-Zawahiri, a cerebral Egyptian surgeon who joined his first jihadist cell at age 15, is as much the force behind al-Qaeda as his more famous friend Osama bin Laden. When the two first met in Pakistan in 1986, al-Zawahiri made a powerful impression on the younger, inexperienced Saudi millionaire. Within a couple of years, bin Laden was funding al-Zawahiri’s militant group Al Jihad, while Egyptian militants close to al-Zawahiri were helping bin Laden found al-Qaeda. That was the beginning of a powerful symbiotic relationship that continues to this day. In the days following Adolf Hitler’s suicide in 1945, amid the rubble of Allied aerial bombardment, the Red Army’s westward advance and Nazi surrender, a company of American infantrymen made their way up Munich’s Prinzregentenstrasse, toward the late Fuhrer’s personal aresidence. Hitler had owned a second-floor luxury apartment in Munich. The soldiers’ mission was to commandeer important Reich documents that might be stored there and to locate Hitler’s will. In the apartment, they found a sculpture and a painting of Hitler’s niece and love interest, Geli Raubal. (Hitler was rumored to have murdered her in the bedroom.) They found costly furnishings, spacious rooms and state-of-the-art gadgetry. They did not find important Reich documents, nor did they find a will. Several floors below there was a bomb shelter. There was also a safe, which an Army mechanic managed to force open. Save for twelve first-edition copies of Mein Kampf, the safe contained not a scrap of paper.